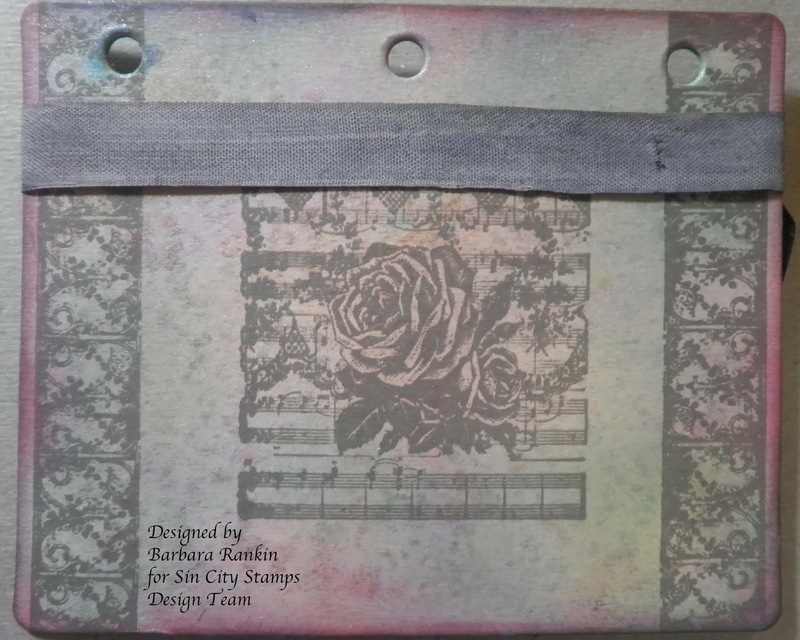 Because my pages are going to end up with dimensional objects on them, any stamping and page coloring needs to be done before adding those items. So, I will attempt to keep things in as much order as possible, but each page will not be embellished with dimension until the very last. Therefore, some pre-planning needs to be done. Starting with the cover, use Sofft art sponge to apply both magenta and green pan pastels to background, blending where the two colors meet. 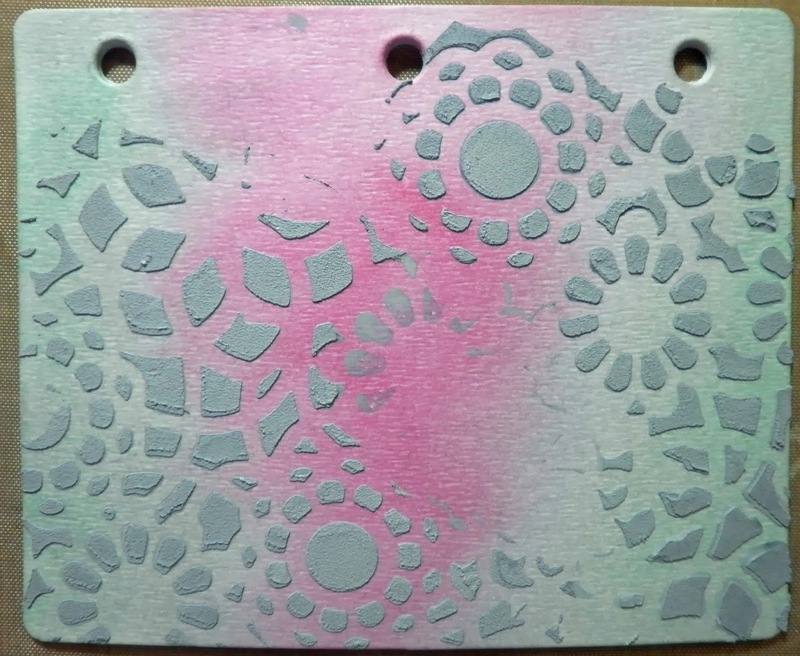 Mix crackle paste with acrylic paint, spread through stencil randomly, as shown. 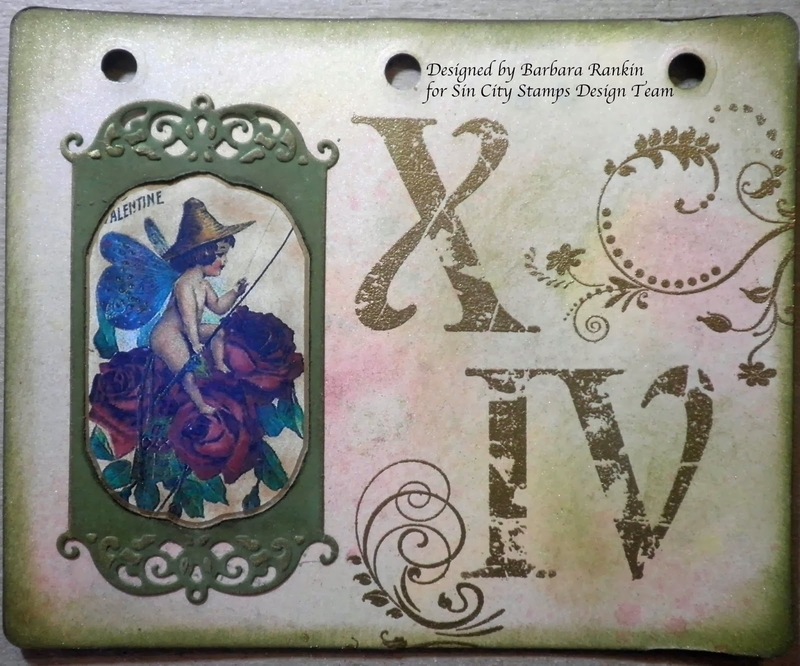 By the way, check out the fabulous stencils that Sin City Stamps now carries. I later inked the edges with brown distress ink (not shown in this photo). Before embellishing the front cover with those dimensional objects I was referring to, I need to work on the reverse side. It will be much easier to stamp and spray and ink at this point. As I said, some pre-planning needs to be done, so have an idea of where you are going with both sides of the page. Spray reverse side of cover page and one side of another journal page with all four Glimmer Mist colors and allow to dry. Set the second page (blank) aside. We are going to work with the reverse of the cover page now. 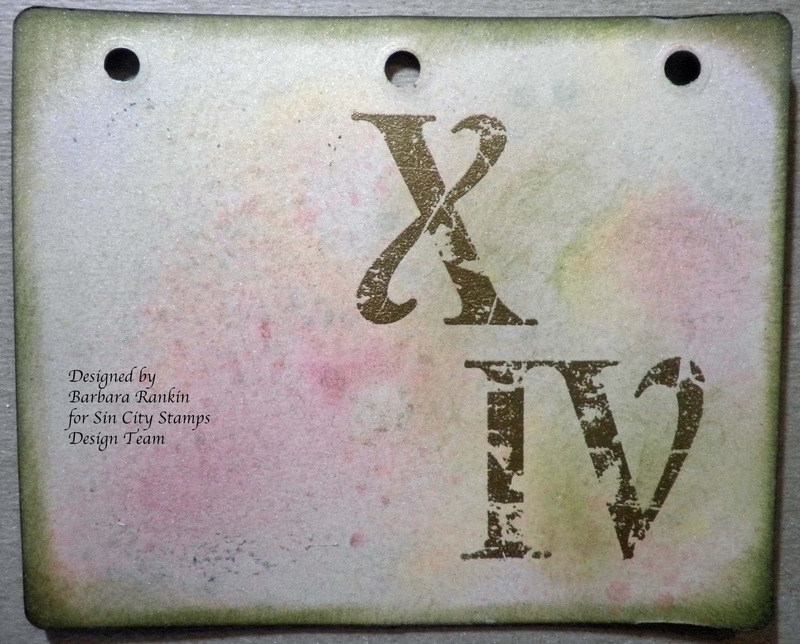 Stamp "X" and "IV" on page with Versamark ink and gold emboss. Edge page with Peeled Paint distress ink. Die cut olive green scrap cardstock with Spellbinders die and adhere over collage image and placing to the left side of the page. Add Encore Gold metallic ink to edges and high spots. Run a gold pen around image inside the frame. I also added some brown distress ink to the bright white background on the collage image to make it more vintage looking. I decided I needed something more on this page, so I stamped scroll flourish in Versamark ink and embossed with gold embossing powder. 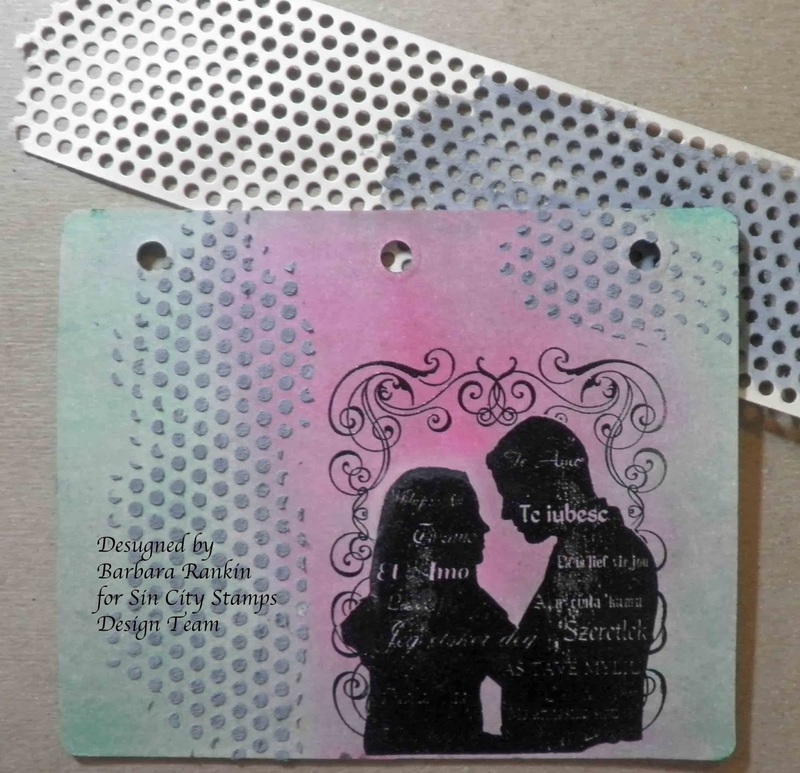 On the front blank side of my next book page, stamp couple from Romance set onto smooth side of journal page with Versamark ink and black detail embossing powder. 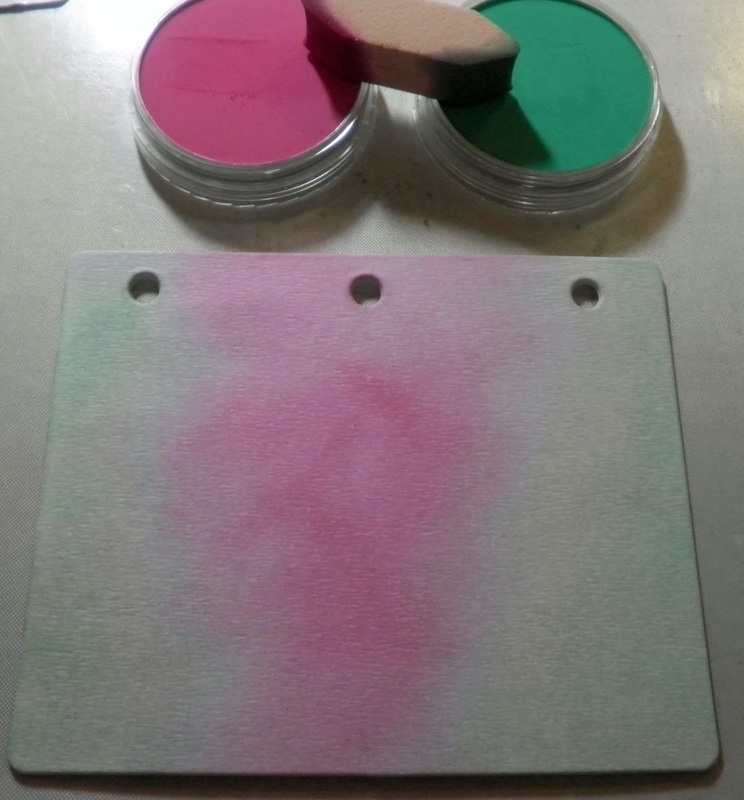 Use Sofft art sponge to apply both magenta and green pan pastels to background, blending where the two colors meet. Mix crackle paste with acrylic paint, spread through joint tape randomly, as shown. Joint tape can be found at the hardware store, and has a light adhesive on the opposite side. 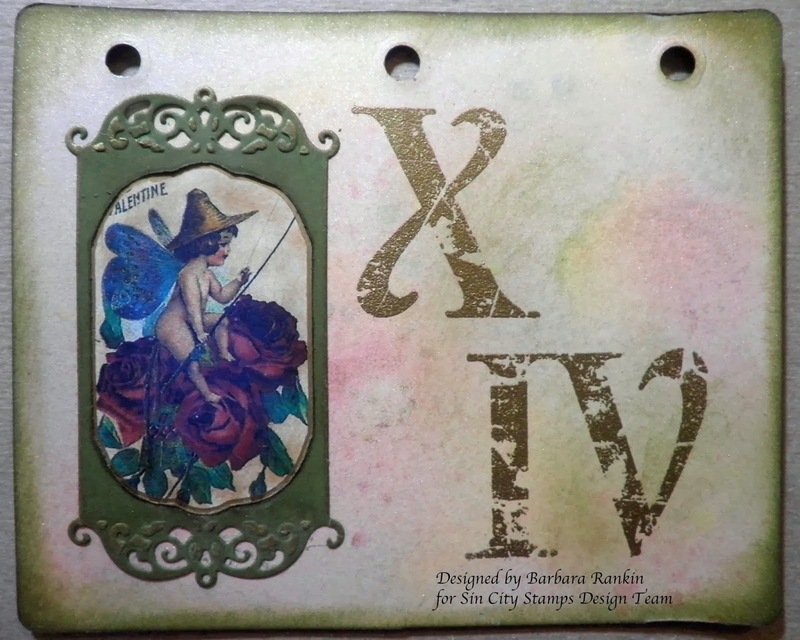 It is one of my favorite things to use for mixed media. 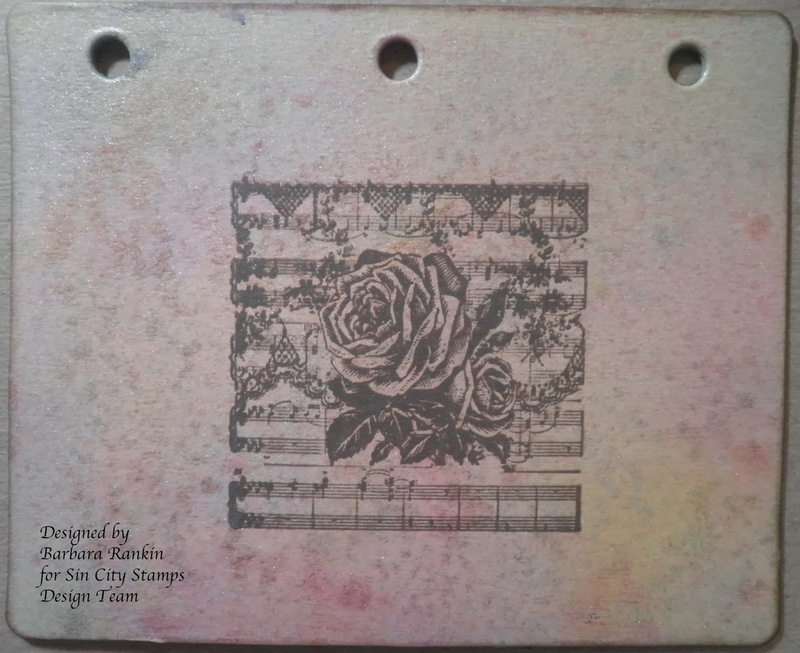 On reverse side previously colored with spray inks, stamp music background with rose image in center of page with Dark Moss chalk ink directly onto journal page. 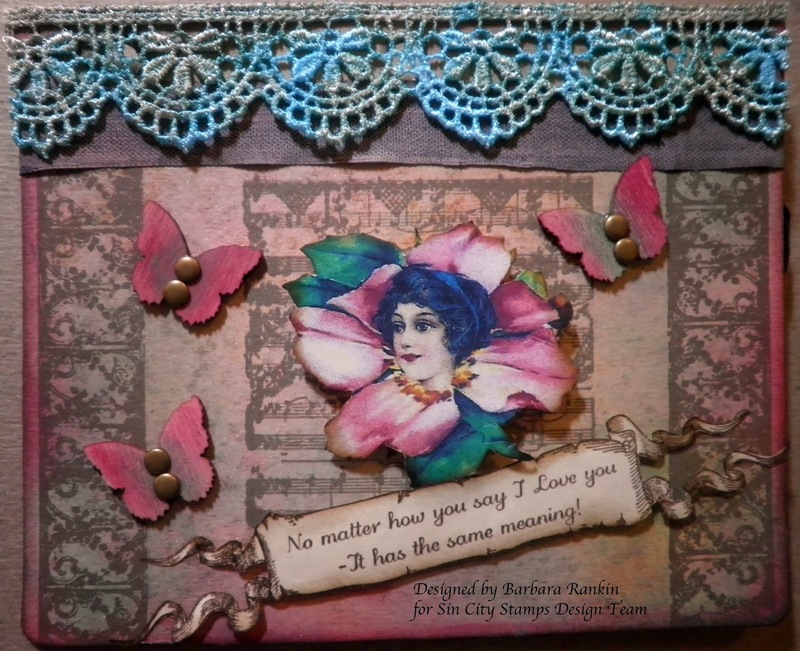 Stamp border along both edges with Dark Moss chalk ink. 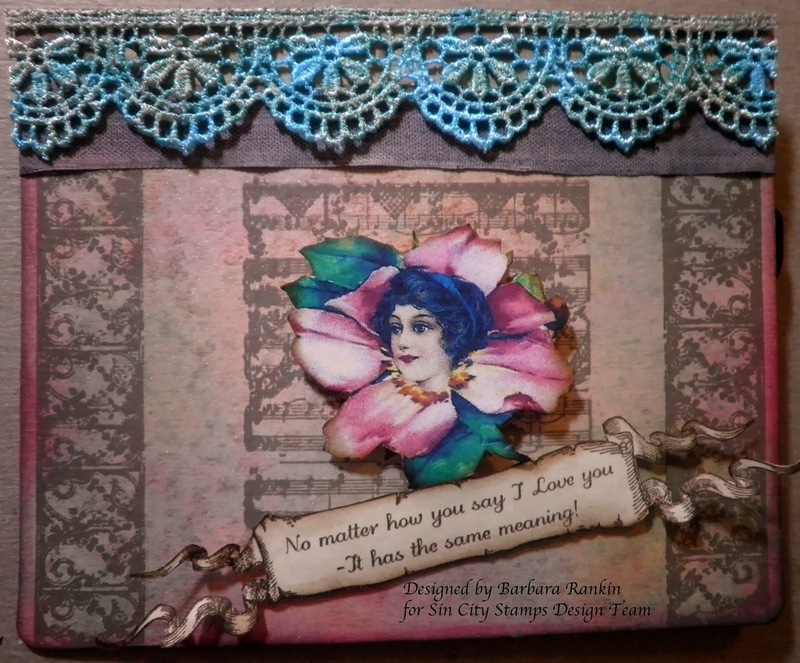 Distress edges with Picked Raspberry distress ink. I cut a piece of black seam binding long enough to go around the whole page, but I did not want the darkness of the black on this side of the page. So, I measured the portion that would appear on this side, taped it off and added Spun Sugar distress paint between the tape to tone the black down. Here, you can see what it looks like on this side of the book page. Wrap black seam binding around book page, tying in a knot on the front. 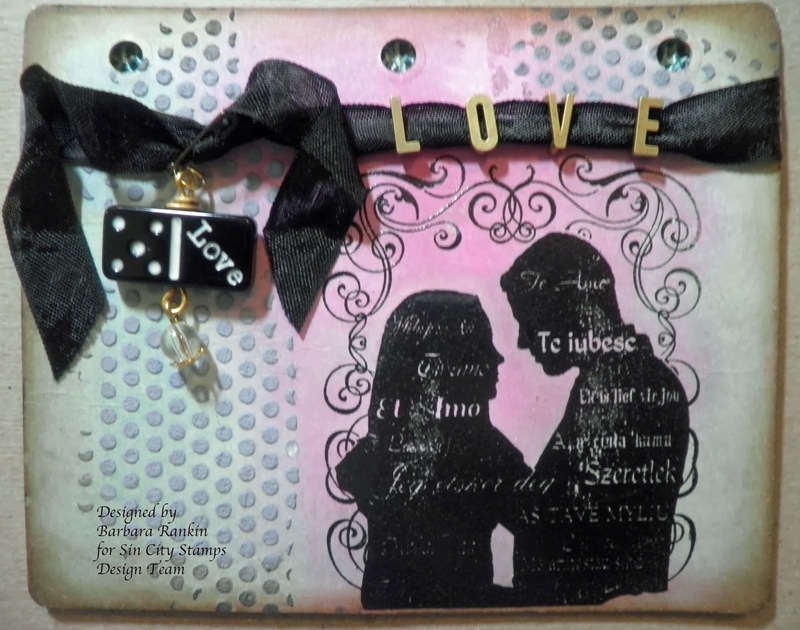 Of course, the L-O-V-E ribbon slides were added before tying ribbon in a knot. 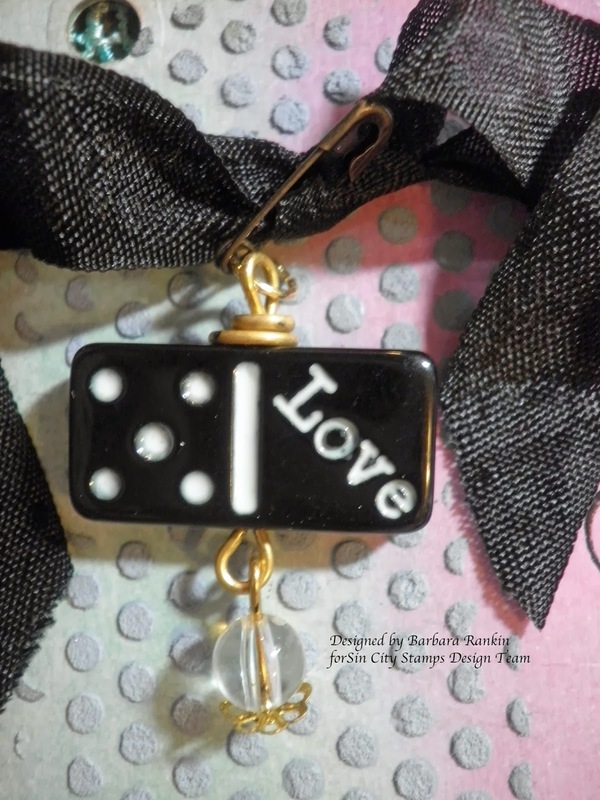 Add Love domino charm from the Frog Dog Studio kit to the knot with a tiny safety pin. See photo. Color white lace with Peacock Feathers distress stain, and age it further with a bit of Old Paper distress stain. Fussy cut lady in flower collage image, edge with brown distress ink, and use foam pop dots to adhere to center of stamped image. 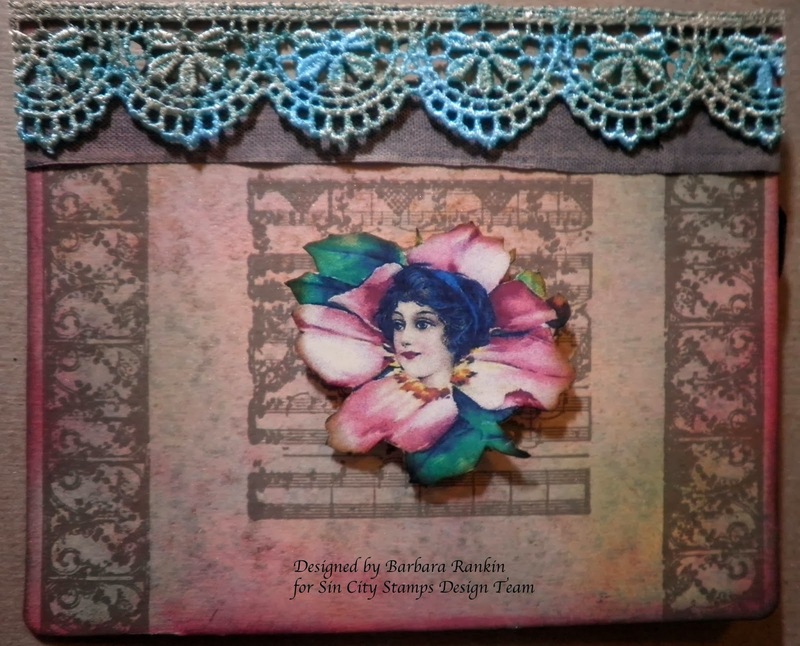 Add lace along top of book page and trim excess, as shown. 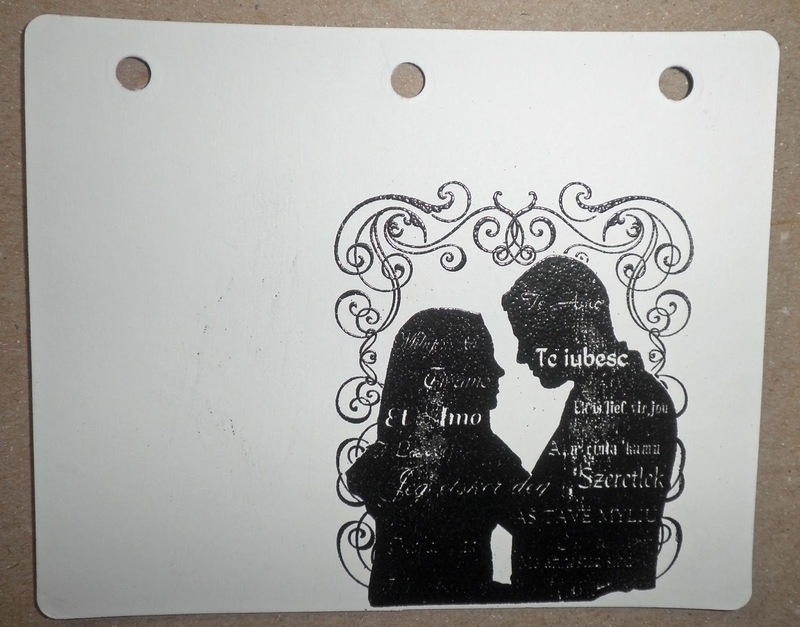 Stamp Love has the same meaning phrase onto a scrap of parchment paper in brown ink and fussy cut. Adhere to bottom of page with foam tape for dimension. 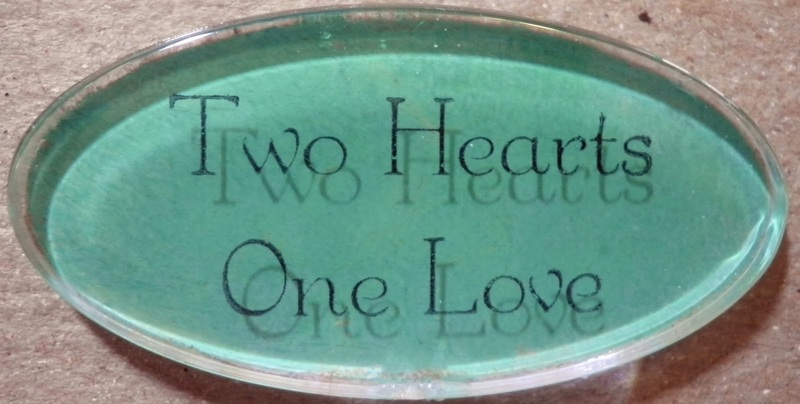 Stamp "Two Hearts One Love" onto an acrylic oval fragment with black Stazon ink. 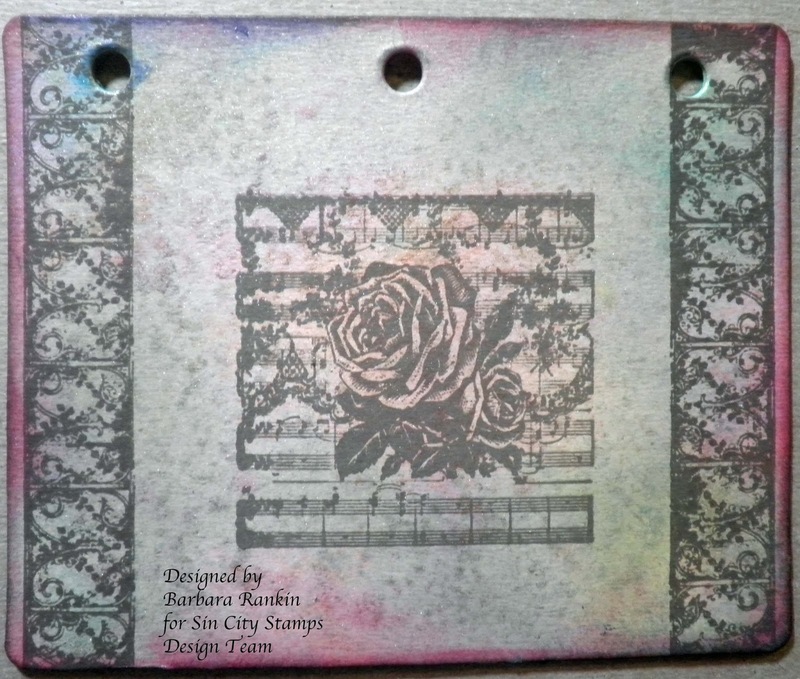 I found it easiest to lay the stamp on the table and lay the acrylic over the stamp, pressing the the acrylic piece onto the stamp. If you make a mistake, you can start over. 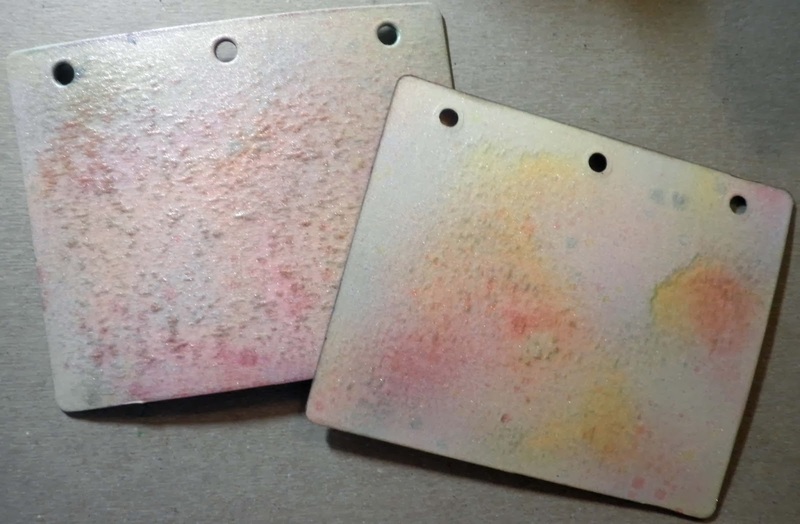 Simply clean the acrylic piece with permanent stamp ink cleaner and try again. 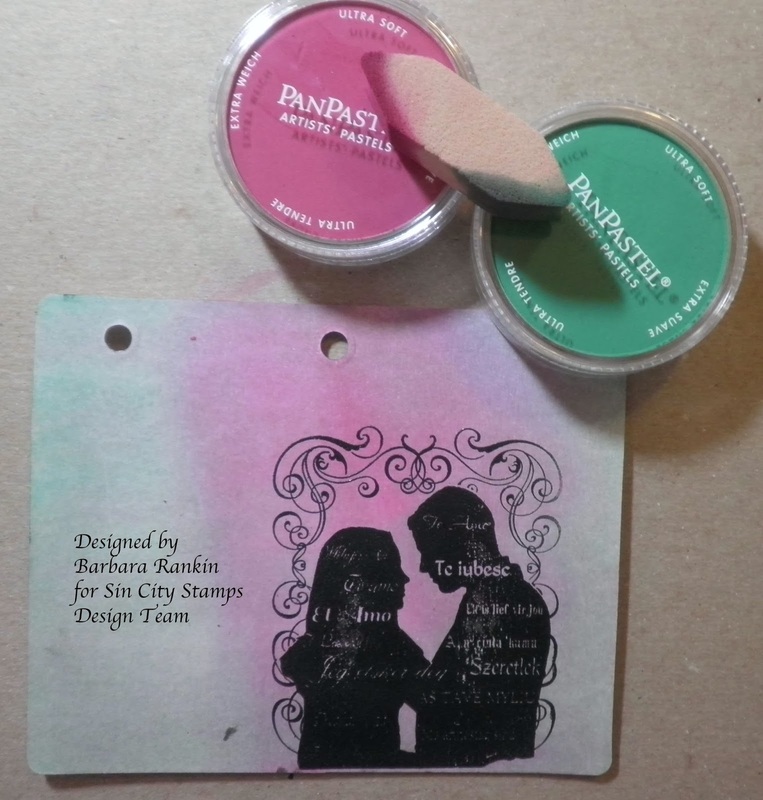 On the reverse side, apply whitewash glaze (or clear drying glue) and when tacky, apply green pan pastel. Set aside. Color white flowers with both magenta and green pan pastels. Add a decorative brad to the center of the pink flowers. 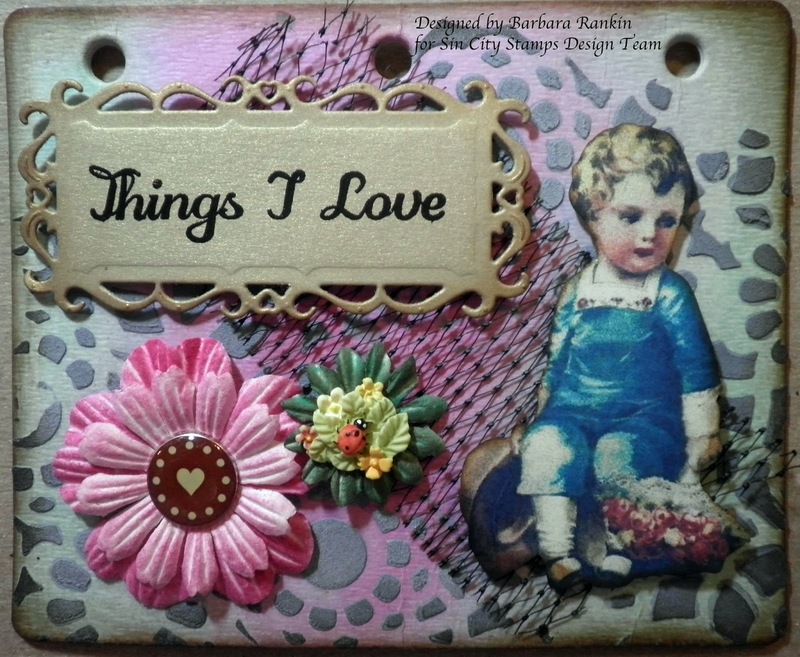 Stamp "Things I Love" in Versamark and emboss with detail black embossing powder onto a scrap of gold paper that has been adhered to very thin cardboard. Center die over words and cut out. Now for some pictures of my additional dimensional embellishments. Front cover: I added black netting from produce, Things I Love die cut label raised with pop dots, a fussy cut collage image of a little boy from the Frog Dog kit, also raised with pop dots, and the two flowers shown above. 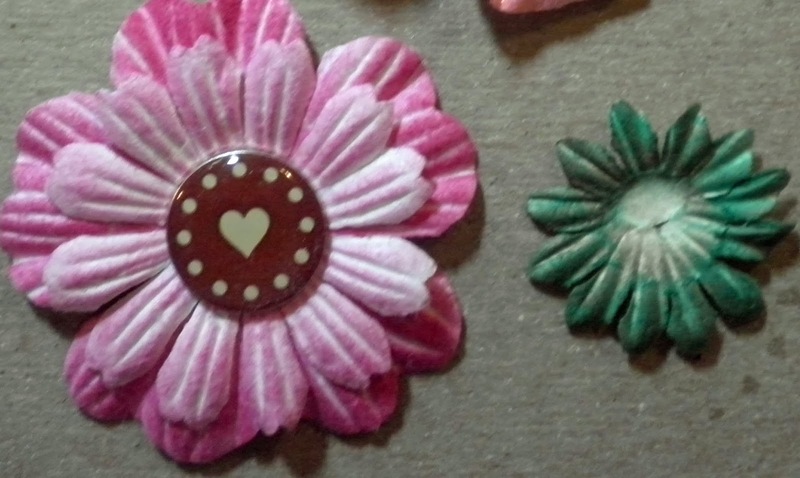 To the center of the smaller green flower, I added a resin embellishment from my stash. Inside front cover: I added a few wooden birds that I colored with both pink and green pan pastels, and added metal studs at each corner. Front of second page: I adhered Two Hearts fragment to a filigree charm, then to the page. Back of second page: I colored three wooden butteflies with Pan Pastels, added a couple of metal studs to the center of each butterfly. Well, that was long, I know, but I hope you enjoyed my little mixed media mini album, well, at least the beginnings of it. I had so much fun making these two pages that I know it won't be long before I finish it. I have lots of ideas in my head for more fun pages. I hope you will visit me at my blog to see what I am up to with this little project. 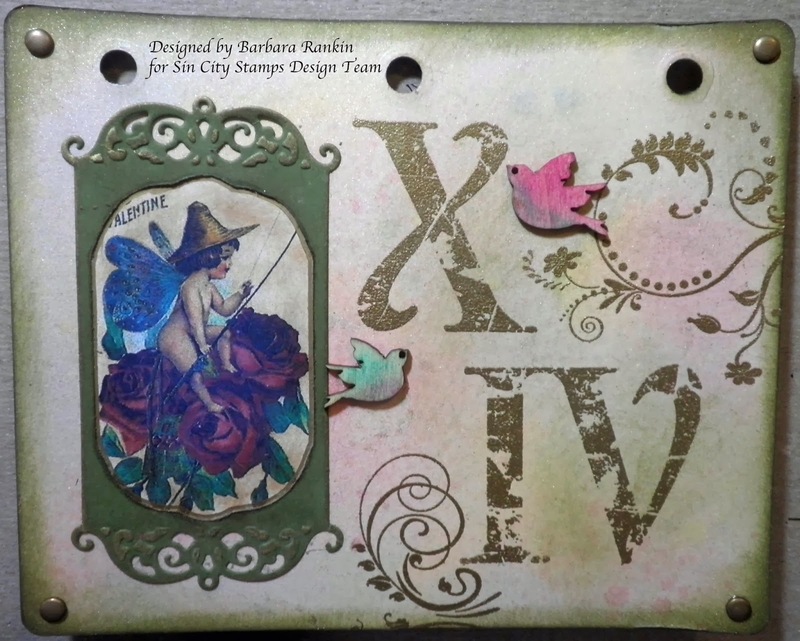 In the meantime, please visit Sin City Stamps for their fantabulous array of stamps, stencils, die cuts, and mini albums. 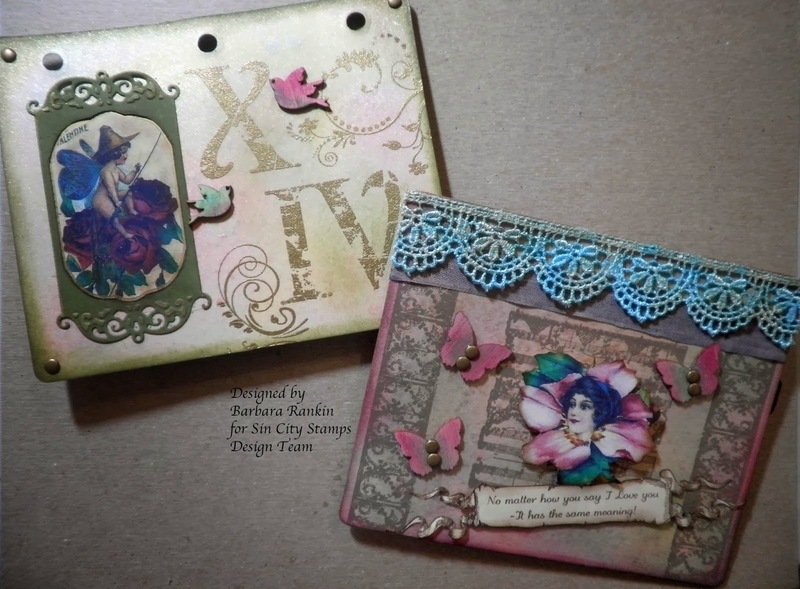 And thanks so much to our sponsor, Frog Dog Studio, for the wonderful mixed media kit we get to play with. I know you will want to check out their website as well to see all of their wonderful products and monthly kits. Have a wonderful, warm, and creative weekend! 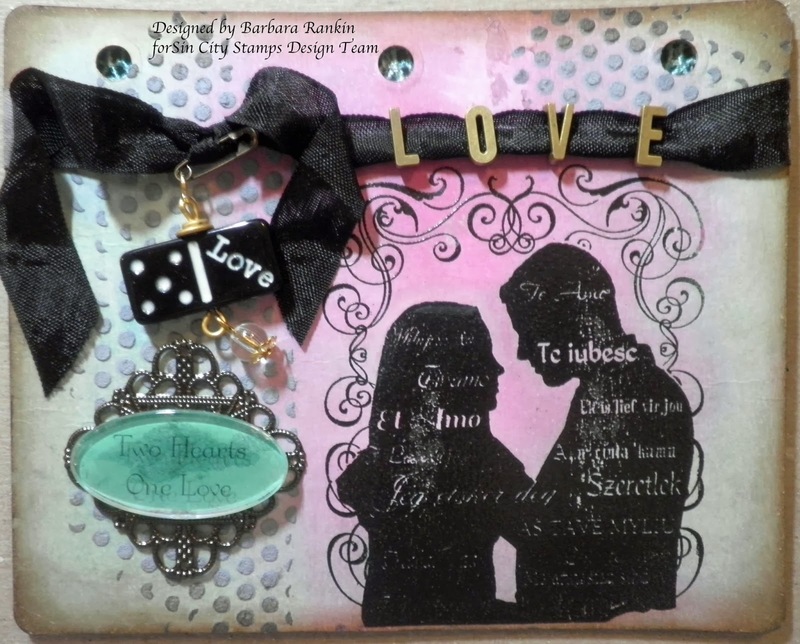 Beautiful Job Barbara! Thanks for sharing! Your pages are wonderful. Hope you'll share again when the project is done.